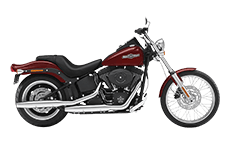 Built low for that vintage rod appearance, the Harley Davidson Softail Night Train series motorcycles are machines for riders who know how to have fun. But only the right pair of saddlebags and bike luggage will help improve the appearance while providing adequate storage. We understand that owners will want a specific type of saddlebag, therefore we proudly offer this collection of Viking saddlebags for every type of rider. From the simplistic styling of the Zen motorcycle saddlebags to the Charger Straight Studded, each model represents the signature line of Viking manufacturing. Don't just take our word for it: see the difference for yourself!